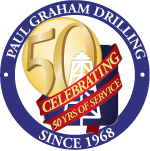 Paul Graham Drilling and Service Company have been serving the Oil, Gas, and Geothermal Industry since 1968. Originally founded by Paul and Le Ann Graham, it has grown to become a leader in providing professional and comprehensive services to its customers throughout California, Oregon, Washington, Nevada, and Idaho. In the beginning, Paul Graham believed that in order to provide excellent service, you must provide experienced personnel, top quality equipment, and an unmatched maintenance program. LeAnn Graham believed that to be successful the finances as well as the accounting practices had to be in perfect order. This philosophy has enabled our company to stay ahead of the competition and remain the most respected drilling contractor for over 50 years. Paul Graham Drilling and Service has always been a family owned business. The original values that made the company great in the past continue to guide its current CEO/President, Jill Graham to maintain the solid values of the past while staying alert and prepared for the future. With 8 rigs serving the natural gas, oil and geothermal industries complemented with trucking, crane, fabrication, welding and machining services we are here to bring your project in on time and under AFE. Our services include Heavy Haul and Specialized Trucking, Cranes to 140 ton capacity, 30,000 square foot Fabrication Facility, Mechanical Engineering, Complete Oilfield Machine Shop, Mobile Welding, Mobile Repair, Safety, and environmental Training. Our expertise is in drilling to 13,500 feet and well servicing to 18,000 feet for Natural Gas, Oil, Geothermal, Natural Gas Storage, Injection, Carbon Sequestration, and Compressed Air Storage. With our Company on the job you can be assured that you will get the attention you deserve from the top down. Because of our size, everyone is involved with your project. Since we have the best personnel and certainly the “Very Best Tool Pushers in the Land, “ we can bring your project in on time and on budget.